Launched in 1964, with the XP64 rake of Class 48 and coaches, the era of Rail Blue was to dominate Britain’s main-line railways for almost two decades until the sectorisation of the 1980s. By the end of steam in August 1968, increasing numbers of locomotives, units and coaches were appearing in the new livery, so much so that the final steam specials operated in August 1968 included blue and grey coaching stock within the formation. For the modeller, the BR blue era has its attractions in that it straddles the period of the late 1960s when steam and green diesels predominated through to the era of sectorisation in the mid-1980s. Moreover, although not all classes of first-generation of diesel and electric locomotives and rolling stock survived to be repainted in blue, there were odd examples of most classes repainted. 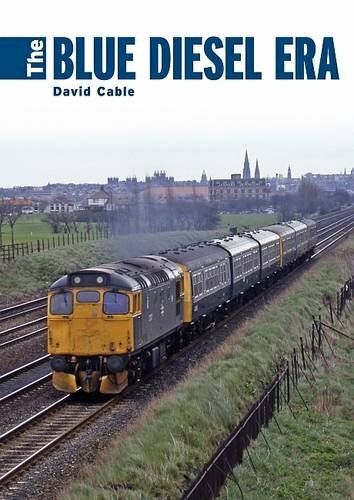 Blue Diesel Era is a compilation of photographs, all previously unpublished, portraying the operation of blue-liveried locomotives and rolling stock throughout the BR network in this period along with detailed captions together with an informative linking narrative.